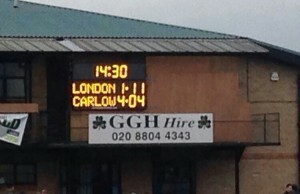 Carlow Association London » Carlow Footballers just manage to hold on against London after a great start. 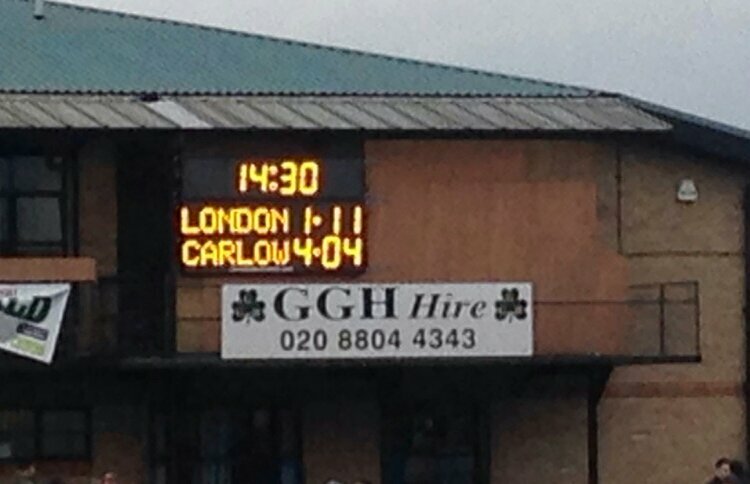 Carlow Footballers just manage to hold on against London after a great start. 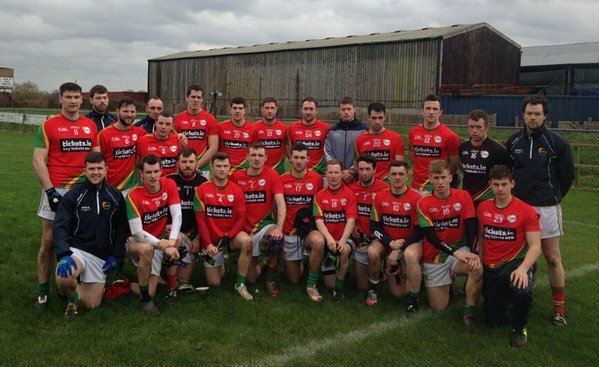 Carlow Senior Footballers travelled to London on Saturday 6th February for their Round 2. Division 4 clash in an effort to salvage something from their 1-12 to 0-10 defeat to Antrim at home the previous week. Although they put in a winning performance at Ruislip and were well in control they eased off in the final quarter with a lackluster finish to it all. 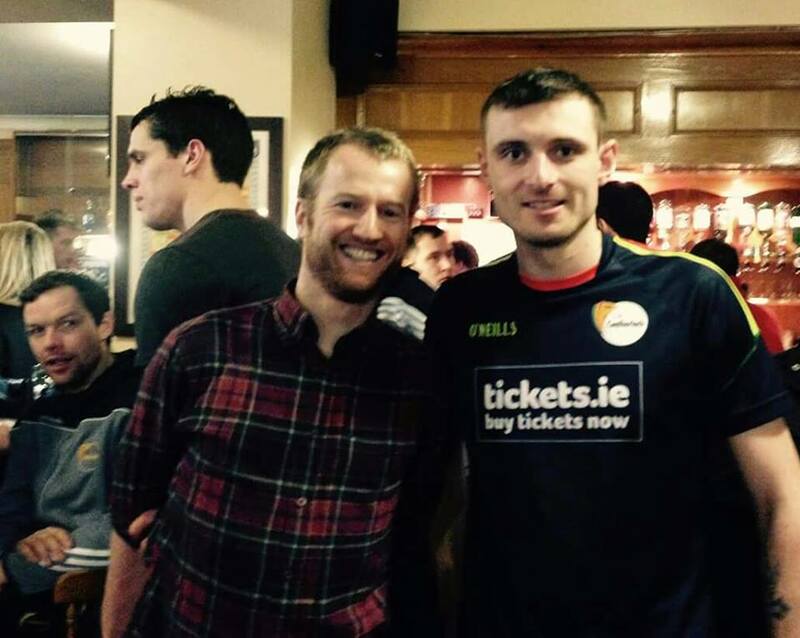 Carlow man in London Niall Sheehan caught up with the action. Carlow Senior Football squad who were triumphant against London. Brendan Murphy added a fine point soon afterwards with London responding through two frees from Scott Conroy, separated in between by a good point from play from the same player. That left a goal between the sides, however JJ Smith won a penalty in the 21st minute following some good build up play. John Murphy duly converted, sending the London keeper the wrong way. Brendan Murphy added two more points (one free) before half time, separated in between by an Adrian Moyles point from play for London. Carlow were well in control at half time, the scoreline reading Carlow 3-03 to London’s 0-5. The second half started with London showing more urgency and opened with another Scott Conroy free, however soon after Carlow breezed through the London defence with Sean Gannon palming to the net from a great JJ Smith pass. At 41 minutes on the clock, this should have been the point at which the result was put beyond doubt, however to London’s credit they never gave up and upped their performance levels significantly from here on in. Carlow and London traded points (Murphy and Conroy (free)), before London took the game to Carlow for the final quarter. The ever impressive Conroy kicked all scoreable frees presented his way providing London with a foothold. The amount of frees which came Conroy’s way may be somewhat attributable to Carlow’s tactics of putting large numbers of players behind the ball in a blanket defence coupled with more intelligent London play of engineering such opportunities. Liam Gavaghan could have brought closer in the 48th minute earlier, however he blazed over for a point when a goal opportunity presented itself. Some credit however must go to the Carlow full back line who put him under significant pressure. That said, Carlow should have converted two very scoreable opportunities before and after, when John Murphy put the ball wide from the right and Hughie Gahan afterwards from the left. This would have abated any nerves in the last few minutes. Conroy continued to add frees, with one Adrian Hanlon point from play brining the gap to six points before a long high ball from the half forward line into the 14 yard line was well fielded and subsequently finished by half time substitute Senan O’Grady ensuring a frantic finale in the three additional minutes of stoppage time. London won another free with 90 seconds left, which Conroy duly pointed from 23 yards out, leaving two between the sides. To their credit Carlow defended well thereafter and their blanket defence repelled London’s efforts. Tempers frayed in the dying seconds when Daniel St.Ledger was black carded for getting involved in a scuffle following some untidy London tackling which left Brendan Murphy injured temporarily. All of the aforementioned subsequently ran the clock down and the referee blew the full time whistle to the relief of all the Carlow players, management and supporters alike. Overall Carlow’s fitness levels were superior and skills sharper, both of which were essentially the difference. In addition to all of the aforementioned, they were more ruthless in their execution in the first half which provided the platform to win the game. Although a largely positive effort; worrying from a Carlow point of view was the manner in which they let London back into the game in the last 10 minutes when victory seemed assured. Part of this can be attributed to London’s good play, however they won a number of soft frees, and, also Carlow could have used the wind to their advantage. As aforementioned Carlow also had a number of opportunities to put clear daylight between the teams in the final quarter that would ultimately have prevented a frantic finale. In addition to this they were unnecessarily involved in a scuffle towards the end. Both are lessons that will need to be learned going forward if Carlow are to progress, where no doubt sterner challenges await. Man of the Match was Brendan Murphy (Rathvilly) who kicked all of Carlow’s points, fielded some excellent ball and consistently distributed effectively. Also very impressive were his midfield partner Sean Gannon, and the entire half backline of Gary Kelly, Derek Hayden, the ever reliable Benny Kavanagh and full forward JJ Smith. London’s best player was Scott Conroy with Patrick O’Hara also impressive in the second half. London: 1. Gavin Mc Evoy; 2. Philip Butler, 3. David McCreevey, 4. Darragh Quinn, 5. Caomhin Carty, 6. Danny Ryan, 7. Colin Dunne, 8. James Moran, 9. Mark Gottsche, 10. James Moran, 11. Patrick O’Hara, 12. Adrian Hanlon, 13. Scott Conroy, 20. Alan Dunne for 14.Lorcan Mulvey – did not start inj., 15. Sean Hickey. Also on panel: Robbie Molloy, Henry Hegarty, Graham Power, Jack Kennedy, Mark Fitzgerald, Paul Broderick inj., Andy O’Brien. Management: Turlough O’Brien; Selectors: Darren Leonard, Tommy Wogan. The game and occasion afterwards was reasonably attended with a good helping of Carlow emigrants making the trip to the Emerald GAA Grounds, and, relatives of players travelling over for the weekend. Hopefully the Carlow hurlers will ensure the double over London is completed in a few weeks time on home turf in Netwatch Cullen Park. Niall Sheehan (L) with his clubman Gary Kelly (MLR). Also in picture is Man of the Match Brendan Murphy standing with Benny Kavanagh sitting down. Niall Sheehan, (30), proud Borris and Co.Carlow man in London. Niall works as a surveyor for Stockdale, having previously worked as a Planner for Wandsworth and Camden Councils. More importantly Niall runs for Newham and Essex Beagles in cross country, track and road. Of greatest importance Niall is a ardent Mount Leinster Rangers and Carlow GAA supporter.